The Portland, OR-based avant-rockers are stilling going at it. This is their 14th release! The audio disc "Two Feathers" starts off in poppier realms and then tends to get progressively stranger. Opener "Aquapipe Netarts" begins with a patentedly dramatic organ-heavy drone, but the song proper is perhaps the most stripped-down from Rollerball yet (not that I've heard it all) and Mae Starr's casual, almost jaded-sounding vocal delivery is perfectly complimented by understatedly angry lyrics about getting high and the "same-ol'-same-ol'". "Rick Wright" is a repetitive rocker with guitar noises and electronic drones under high-mixed vocals. "Camera'd" is a bland pop number with a depressive tone. Better, though, is "Say It", which features a solid groove of nicely syncopated percussion, maybe two drummers here... or studio tracking. "South Dakota" is a really nice tune, Mae's voice more melodious and a beautiful piano melody to accompany the horns during the instrumental segments... but then I would have preferred a return of that passage to the more atonal jam that wraps up the piece. "Horrible Madness" is a vital heavy rocker with a fantastic grind of horns, noise and warbling bass, while Mae's vocal is gloriously fed through an excellent process. Then comes "Cellophane Wing", a cool symbiosis of obnoxiously abrasive noise and a pretty whistful piano line. "Spool" closes the album with seven straight minutes of murky noise-drone, twang and free-jazz pitter-patter. This isn't Rollerball's strongest effort overall, but as always they've provided some great pieces. The second disc of the collection is a DVD. It's interesting at first to hear the classic slinky freak-out jam of "Butter Fairy" set to visuals of surreal blurry, gritty city scenes, but ultimately the audio-visual doesn't seem to match up in tempo or content, especially once the frames have become more centered on random shots of townspeople, dogs and band members. (Though you gotta love the shot of a rear-window sporting band decals of "The Doors" and "Rollerball"!) The next video, "3 Brunos", by long-time visual-collaborator Starbage Hands, is a nearly feature-length documentary of the band's extensive tour/vacation in Italy, and as their situation unfolds, is seems to parallel the story of Tuxedomoon in many ways. 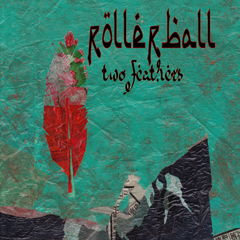 Live video of Rollerball and fellow tour-bands Ovo and Ronin are interspersed with interviews with musicians, live mixers, promotors. Ghetto "squat buildings" are taken over for practice/performance spaces. A masked band offers bizarre performance art, scarifying metal shriek, hip-hop dance. The political aspects are generally more implied, though there may certainly be some hints of a desire for expatriotism and such. Mae offers very tentative comments on communism, the Rollers spend time at the beach. Overall, I like that this American band seems to remain quite genuinely and unpretentiously American. The rest of the video tracks are shorts. "Quiela" is free-jazz/noise set to Starbage's creepy skeletons and marionettes. "Subtle Adjustments" is a brief and disjointed short, featuring Rollerball rolling balls (bowling) and poses the question: "Is basketball jazz?" Back in Italy... from what I can tell, Jocopo is a promotor and musician, and the final video "Jocopo's House" features the band in a squat, jamming away with two drummers locked in a solid steady groove while the rest add lighter touches.